Each 8-Box Case contains dual autograph! Supefractor, Printing Plate, Blue, Black, Gold, and Regular Refractors! Tim Tebow, Sam Bradford, Dez Bryant, Ryan Mathews, Jimmy Clausen, C.J. 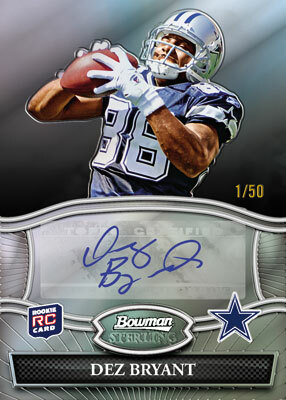 Spiller, Jahvid Best, and other big names rookies grace the auto checklist! Adrian Peterson, Drew Brees, Ray Rice, Percy Harvin, LaDanian Tomlinson, Felix Jones, Eli Manning, and many other veteran stars grace the auto checklist! 5 different "6 Auto" cards featuring different rookie combos (Bradford/Tebow/Clausen/Bryant/Demariyus Thomas/Mike Williams)! 5 different rookie "Quad" autographed cards (Bradford/Tebow/Clausen/McCoy)! 5 Rookie Triple Autographed Cards, 10 Rookie Dual Autographed Cards! 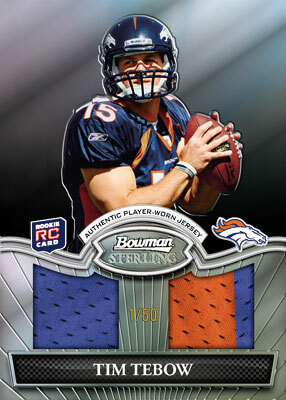 Autographed Relic checklist includes most rookies that attended the Rookie Premiere signing day! 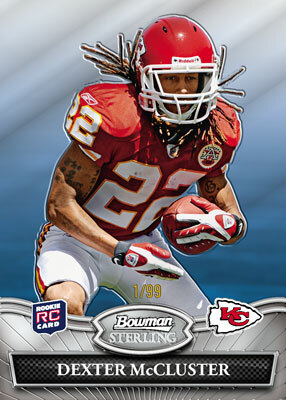 Bowman Sterling returns for another season of high-end gridiron action. 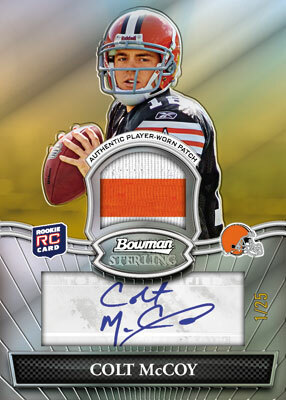 What sets Sterling apart from most other Topps Football offerings is that the base set is filled with rookie autographs, relics, and relic autographs, which means they qualify as true rookie cards. 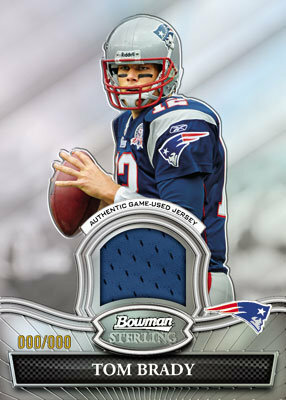 If your looking for a challenging and rewarding set to build, give 2010 Bowman Sterling a look come December.